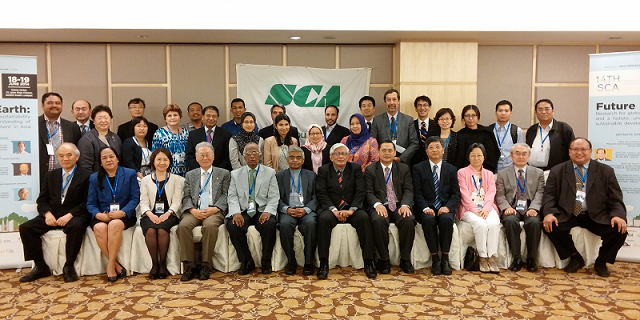 The 14th SCA Conference was held between 17 and 19 June 2014, at Istana Hotel in Kuala Lumpur, Malaysia. On 18 and 19 June, SCA International Conference "Future Earth: Research for Global Sustainability and a Holistic Understanding of Sustainable Development in Asia" was organized by Academy of Sciences Malaysia (ASM), Ministry of Science, Technology and Innovation Malaysia (MOSTI), Institute for Environment and Development (LESTARI), and International Council for Science (ICSU) Regional Office for Asia and the Pacific. The International Conference was composed of a series of keynote lectures, parallel symposiums/sessions, poster sessions and a panel discussion. It was attended by more than 200 participants from about 20 countries. Before the International Conference, SCA Joint Project Workshops was held on 17 June, and three ongoing research projects between Malaysia and Japan were presented with the cooperation of Singapore Office of Japan Science Technology Agency (JST) and JICA Malaysia Office. At SCA General Assemblies and Management Board Meetings convened during the three-day Conference, statutes/by-laws were amended and new officers were elected. Furthermore, applications for new SCA membership from Academia Sinica and Myanmar Academy of Arts and Science were unanimously approved. The total number of member organizations expanded to twenty nine.